For the 4th time, the W540 keyboard has about 7 of its keys stop working. The seven keys are usually on the right hand side and in a group, but could be in any row, and within 1 or 2 columns of each other. Pressing the key does nothing, not even the click in click mode. I am convinced this is not a software problem as I have tried all possible software remedies. I am sure it is due to the keyboard or connection itself. First time this happened after a year of use, I lost 'P' and '0' among others, and I had to replace the keyboard. A year later on the new keyboard it happened again, but came back after two days. 3rd time was four months later, and I have lost '-', '=', '5', '6', delete, and others. I remapped these. Then again now I lost another bunch including '\', backspace, enter, and others. The original keyboard is a backlit keyboard FRU 04Y2387, ID# 48L16M, Parts # 0C44952, Model # KM BL-105US . Replacement keyboard also backlit and exact replacement. Short of replacing the keyboard, or resetting the keyboard connection and cleaning the contacts, (all tried) what is there to do? Is this a contact problem or keyboard problem? Has happened with two different keyboards. Is this a common problem? Any help will be of great assistance and will be greatly appreciated. After replacing three keyboards and finally getting a stable one, I would like to offer this theory: Problem is only with the backlit keyboards, and non-backlit seems to be more stable. Furthermore, I suspect the issue starts with grains of salt entering the keyboard (yes I do eat chips above the keyboard!). Then maybe when fluids or rain enters the keyboard it shorts some high-impedance lines. I never washed any of my keyboards. But next time I open the laptop I will test this theory by washing a bad keyboard and see if it will get the missing keys back again. What most likely happens is the salt, along with some moisture, eats away at the fragile membrane traces. As a trace gets eaten away, those keys connected to that trace get disconnected, and the non-backlit version probably is more resistant due to not having holes for the LEDs. IDK why your machine's keyboard stopped working and of the 10 years there has been a laptop at my kitchen table, not once has there been a single keyboard failure, even on my X240 and Yoga. Wierd. The salt theory is essentially verified. I deep bathed the bad keyboard with the missing column of keys, with hot and cold water. After drying it out, I put it back in the laptop. Lo and behold, the missing keys which had never responded in any of my tens of attempts were now working. This is the first time that I was able to get a response from the missing keys (p [ ' ; / = -). There were some new issues with the keyboard which I attribute that to washing the keyboard. So I will have to wait till it dries off completely, and test it again. Apparently the impedences are so high in this keyboard that a trace of salt or some foreign material can short the lines. 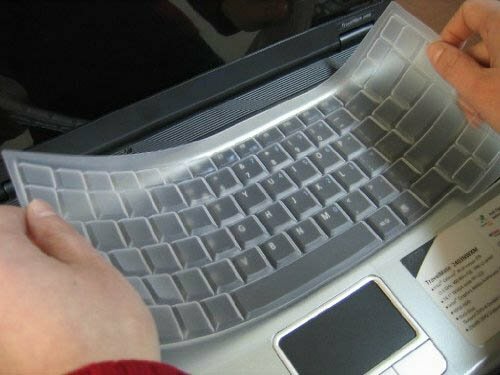 Either stop eating above your keyboard, or install a protector, something like this.